To start your commercial pilot training you require a UK issued EASA Class One Medical Certificate. The aim of which is to ensure you meet the standard medical requirements of operating an aircraft and to be mentally and physically fit to safely exercise the privileges of your licence. Medical certificates need to be revalidated every year, so it is important to maintain high levels of fitness and health to train and work as a pilot. It is your responsibility to ensure that you have a current and valid Class One Medical Certificate before you start your commercial pilot training and a copy of your valid certificate will be requested when you submit your admission form. To obtain a medical certificate you must first book a medical examination which take place at an Aeromedical Centre (AeMC). These are specially approved medical facilities authorised to issue initial EASA medical certificates for pilots. You make the appointments direct with your chosen Aeromedical Centre 3 months in advance of the start of your training. We suggest a budget of £500 to £600 for obtaining your medical certificate however, costs may vary according to which Aeromedical Centre you choose, and whether any additional investigations/tests are required. A medical examination and the required tests will take around half a day (up to 4 hours) to complete. There are certain items you will need to complete before hand. If you wear glasses or contact lenses for example, you must bring your most recent optician’s report along to the examination. Your AeMC will be able to help you with any additional individual preparations you need to make before your appointment. One of the items you must bring is your application form, a copy of which can be found here. Medical History - These are a series of questions about your medical history and any previous illnesses. You will go through your application form and discuss any medical history with the medical examiner. Further details of the medical requirements can be found here. Colour Vision - You will need to pass an Ishihara test for the initial issue of a medical certificate. Colour vision guidance material (from the CAA) can be found here. Eyesight - Eyesight requirements can be found here. Eyesight requirements will include factors such as Distance Vision, Near Vision, the need for Glasses or Contact Lenses, Eye Surgery and Eye Function etc. If you wear glasses or contact lenses it is important to take your last optician's report (must be within the year preceding the medical exam) along with the examination. An applicant may be assessed as fit with hypermetropia (long sighted) not exceeding +5.0 dioptres, myopia (short-sighted) not exceeding -6.0 dioptres and astigmatism (difference between the eyes) not exceeding 2.0 dioptres. Full Class 1 Visual Standards guidance is listed here. Physical Examination - A physical examination is a general check that all is functioning correctly. It will cover lungs, heart, blood pressure, stomach, limbs and nervous system. Hearing - A pure tone audiometry test will evaluate your hearing. Applicants may not have a hearing loss of more than 35dB at any of the frequencies 500Hz, 1000Hz or 2000Hz, or more than 50dB at 3000Hz, in either ear separately. Electrocardiogram (ECG) - This measures the electrical impulses passing through your heart. Changes on an ECG require further investigation. A report from a cardiologist and further tests (for example an exercise ECG) may need to be done. Lung function test (spirometry) - This tests your ability to expel air rapidly from your lungs. Abnormal lung function or respiratory problems, e.g. asthma will require reports by a specialist in respiratory disease. Haemoglobin blood test - This is a finger prick blood test which measures the oxygen-carrying capacity of the blood. A low haemoglobin is called anaemia and will need further investigation. Lipids / Cholesterol - A finger prick blood test which is used in part to determine your risk of future heart and blood vessel disease. Urine test - You will be asked to provide a sample of urine, so remember to attend for examination with a full bladder. This tests for sugar (diabetes), protein or blood in the urine. 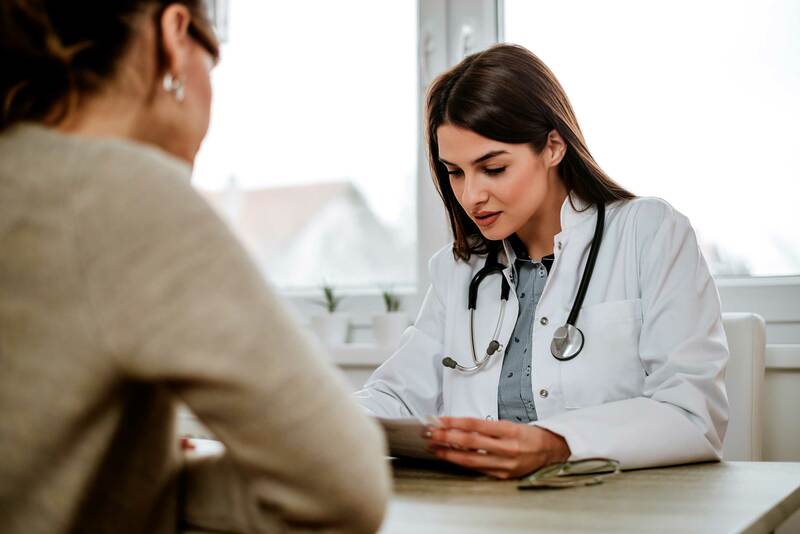 Once you have passed your medical examination, your medical certificate can be issued on the same day as the examination (if all the standards are met). However, if the required standards are not met or further investigations are necessary before a decision on medical certification is possible, then issuing a certificate will take longer. FTA requires a copy of your current and valid EASA class one medical certificate before you start your course. You will not be permitted to fly an aircraft until a copy has been provided. A class one medical certificate is valid for 12 months unless you are 40 or over and carry out single pilot commercial air transport operations carrying passengers; or you are over 60. In both cases, it is 6 months. Every year, you need to revalidate your medical. This is at a much lower cost than the initial medical and often your employer will pay for this for you (airlines and details vary) once you have secured a job with them. A medical certificate can be revalidated before it expires or renewed after it has expired. Revalidation and renewal examinations should take less time than those required for initial issue and they may not require all the additional tests. This depends on when the last test was carried out, the type of certificate held and your age at examination. You can revalidate a class one medical certificate by taking a revalidation examination at an Aeromedical Centre (AeMC) or by appointment with an Aeromedical Examiner (AME). Information regarding renewal and revalidation is available on the CAA website. How long does it take to obtain a medical certificate? You can download a copy of this flowchart here. Due to the high volume of applicants and limited Aeromedical Centres in the UK, the average waiting time is around 2-3 months. However, cancellations can often occur so it is always worth phoning your chosen Aeromedical Centre to ask for cancellations or any last minute appointments to help speed up the process. Further information regarding where you can go to complete your medical can be found here. Students from outside Europe can only undertake our modular based courses here at FTA. More information on this can be found here. Regarding obtaining your medical certificate, the same procedure applies. 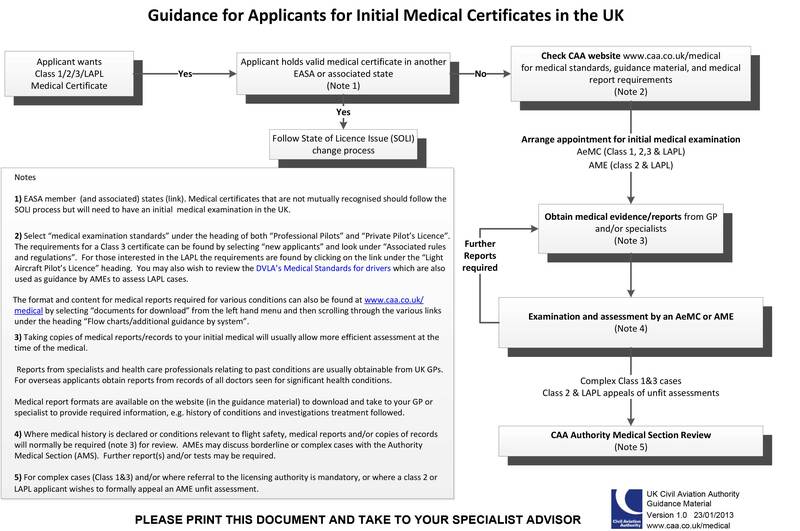 In addition, if you hold a non-UK medical certificate or licence and are looking at how to obtain a UK version, please visit here to seek further information regarding this. You may wish to look into 'loss of medical' insurance. This is probably the most important cover that an commercial pilot can have. Loss of medical insurance is a special type of policy which typically pays you a lump sum in the event of an accident or illness which results in the loss of your Class 1 Medical certificate, preventing you from flying as a commercial pilot. We suggest that you start the process of applying for your medical certificate, whilst also researching which flight school to enrol with. You need to allow 3-4 months before you start your pilot training to obtain your certificate and if you have any specific concerns, it is advised that you contact your local AME to discuss them in the first instance. Please feel free to contact FTA with any question regarding your medical licence.